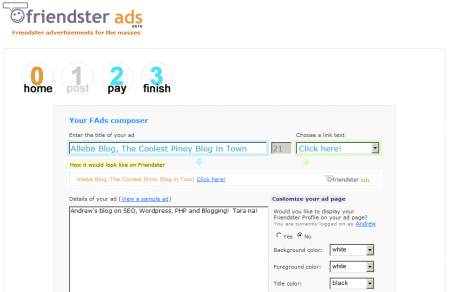 I got an invitation to try Friendster Ads (FAds) Beta (clap3x) with a credit of P50, or equivalent to 625 views. Not bad for a freebie, but I’ll have to see first if it’s an effective form of advertising. P50 is really very cheap (less than a US$ buck), so anyone can basically advertise anything under the sun. Setting up the ad was quite easy. It took only 3 steps in about 5 minutes. I’ll report on the results soon. We look forward for more feedback. 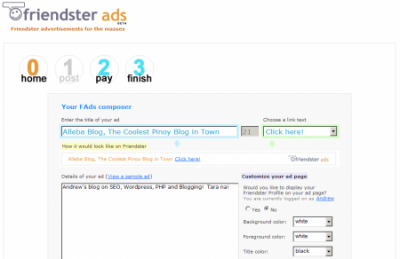 How do we get a free invitation coming from friendster ? That was a rare opportunity i guess. Could you please tell me how to get an invite?